Boasting the same beguiling beauty as the geishas for Japan themselves, Geisha Story Jackpot is a five reel, 15 payline and three row slot which is certainly easy on the eye. That’s not all that’s good about this game, however, as it also offers players the chance to win one of four different progressive jackpots and includes interesting and potentially really beneficial features, such as free spins and scatter wins. Players can randomly trigger a jackpot game at any time, giving them a chance to win one of four great progressive jackpots. The game’s theme is well used to make Geisha Story a really attractive slot. A bonus round that triggers free spins, scatter wins and a wild symbol help to boost winning potential and give the slot a comparatively high 96.48% theoretical return to player percentage. The payouts available in the slot’s main game are comparatively low, with the top jackpot reaching only £2,000 at the highest bet level. Higher rolling players will be disappointed by the limited range of comparatively small stake amounts which are made available. 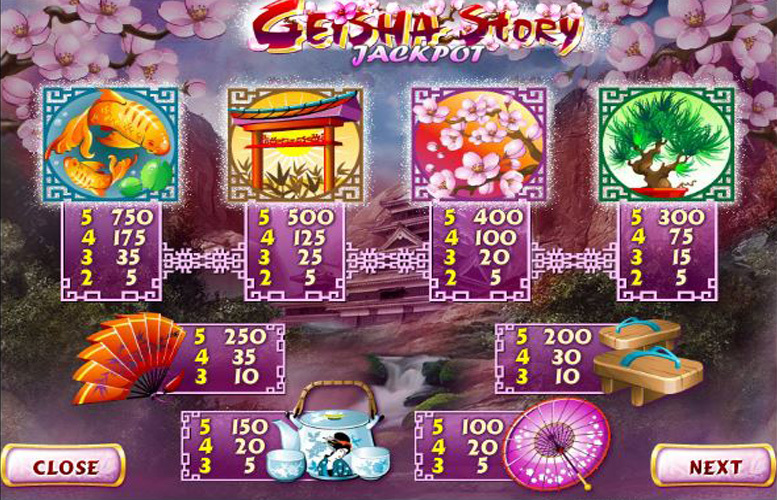 Aside from the progressive jackpots and potential winnings from scatters or free spins – all of which we will discuss later – Geisha Story Jackpot’s top jackpots are triggered when five matching symbols align consecutively along an active payline. The most valuable jackpot of all results when the five symbols in question are the slot’s wild symbols. Five of those in combination trigger a payout worth 10,000 times the chosen line bet for the spin in question. As the highest possible line bet is 20p that means the top jackpot is worth a maximum of £2,000. 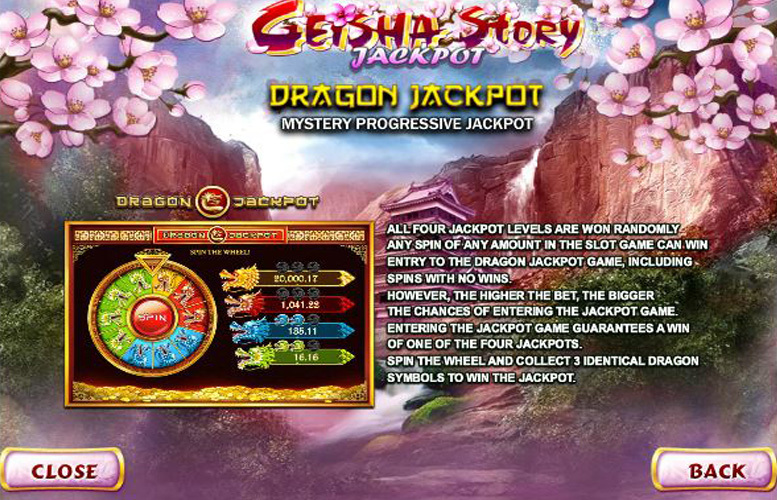 The reason why Geisha Story Jackpot’s main game jackpot is comparatively so low is because the slot includes loads of additional features to supplement and boost main game winnings. Those features include wild substitutions, scatter wins, a bonus round which triggers free spins and a link to four separate progressive jackpots. Showing off an image of a potential suitor for the game’s title character, the slot’s wild symbol can substitute for all other symbols apart from the scatters and bonus symbols which will be discussed below. Depicting an image of an old man with a long beard, when three or more scatter symbols appear anywhere on the reels, a player will receive an instant win. The win will be worth either five, ten or 50 times the total bet depending on whether three, four or five scatters appear. Triggered by the appearance of a geisha bonus symbol on both reel one and reel five, the Geisha Garden bonus round allows players to earn potentially very beneficial free spins. The first part of the bonus asks players to choose a fan from a selection of five in order to trigger up to 20 free spins. A further choice of a fan, meanwhile, then determines the size of the multiplier applied to those free spins. After any spin, a player can randomly trigger the Dragon Jackpot Game, which is linked to not one but four separate progressive jackpots. They must then spin that game’s wheel in order to see which of the four jackpots they have won. 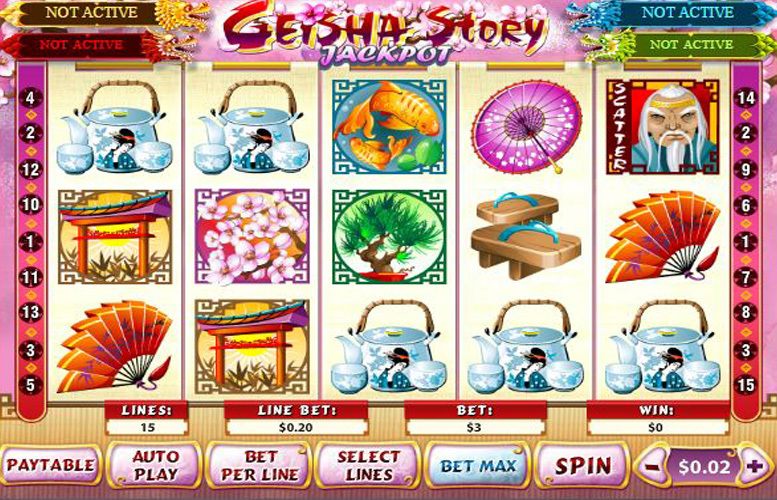 All of the symbols on the Geisha Story Jackpot reels depict traditionally Japanese images, such as tea ceremonies, blossom and pagoda type structures. The most valuable of the regular symbols, when it comes to payline combinations, are those showing off an image of koi carp and an image of a pagoda. If five of the koi carp symbols appear along an active payline, it triggers a payline jackpot worth 750 times the line bet. If it is five of the pagoda symbols which appear, meanwhile, the resulting payout will be worth 500 times the line bet. Perhaps due to the potentially very large multiplier which can be applied to free spins, Geisha Story Jackpot players are limited to comparatively low stakes. In fact, the maximum total bet per spin stands at just £3. That maximum bet can be achieved by activating all of the game’s 15 paylines and choosing the highest possible line bet of 20p. A minimum stake of just 2p, meanwhile, can be selected by activating just one payline and choosing the lowest possible line bet of 2p. 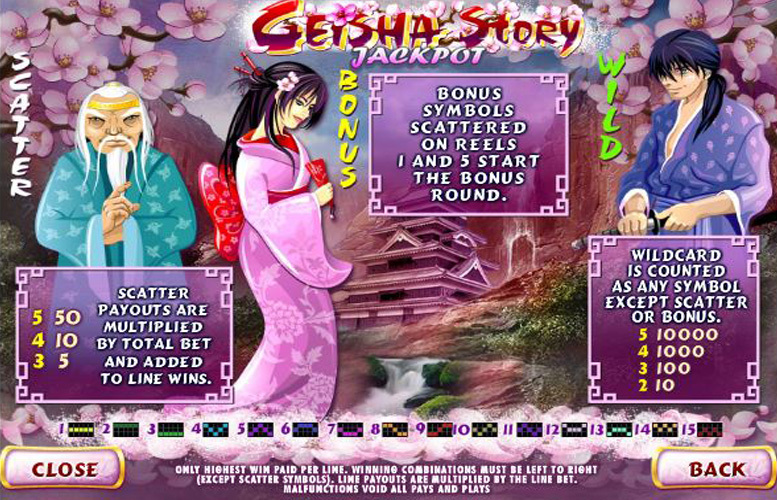 An aesthetically very attractive slot, Geisha Story Jackpot also has a number of other notable features to recommend it. Its linkage to four progressive jackpots, for instance, is likely to be enough on its own to attract many players. Aside from that, however, the slot also includes additional elements such as scatter wins and free spins with generous multipliers. Those extra features help to make gameplay more interesting and, importantly, boost the size of potential winnings significantly. The reason that is so important, however, is because the general payouts available through the Geisha Story Jackpot main game are quite disappointing. That, together with the limited range of possible stake amounts, might well put many players off. This game has a rating of 4 / 5 with 357 total reviews by the users.